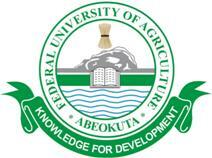 Federal University of Agriculture, Abeokuta (FUNAAB) Post-UTME and Direct Entry Computer Based Test Screening Exercise Form, Eligibility, Admission Screening Requirements, Date, Time and Venues for 2018/2019 Academic Session. The Pre-Admission Screening Exercise is Computer-based and holds between Monday, 24th and Wednesday, 26th September, 2018. UTME and DE candidates are to visit FUNAAB Admission Portal from Monday, 17th September, 2018 to check and print the schedule (venue, date and time) for their Computer-Based Test. A Pass in Biology with Credit in Agricultural Science is acceptable ONLY for courses in Agricultural Programmes. The University does not accept Agricultural Science in lieu of Biology. Candidates seeking admission into the Federal University of Agriculture, Abeokuta should note that they have the SOLE responsibility of ensuring that they meet the minimum admission requirements at Ordinary Level, OND, NCE or HND before making any payment. If at any point it is discovered that the candidate does NOT meet the minimum admission requirements, such offer of admission shall be withdrawn and payment made is NON- REFUNDABLE. Candidates are expected to forward their Academic Transcripts to the University Registrar not later than Friday, 28th September, 2018. Note: Applications for refund on losing admissions offer will not be entertained. It is the responsibility of candidates to ensure they meet the minimum admission requirements before making payment for acceptance of admission offer. Eligible candidates are to access the Federal University of Agriculture, Abeokuta FUNAAB Admission Portal, click on “Apply for Admission” and enter their JAMB UTME or JAMB Direct Entry Registration Numbers to generate and print out their Application Invoice which states their Reference Number and other information on payment of a non-refundable fee of Two Thousand Naira (N2,000.00) only, excluding REMITA charges. Application opens on Monday, 13th August, 2018 and closes on Friday, 21st September, 2018..
No complaint of wrong Bio-Data, O’Level results, OND/HND/NCE/A-Level/IJMB/JUPEB results or blank picture would be entertained thereafter.